pinakothek der moderne was designed by stefan braunfels and has some truly amazing cast concrete facework. unfortunately, the modern section was mostly underwhelming. fortunately, i could have spent at least four hours in the contemporary galleries. there were many john chamberlains, though the best one was acme thunderer, placed in a hallway drenched in light from floor-to-ceiling windows. 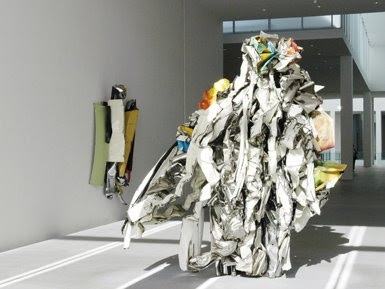 john chamberlain, acme thunderer, image from the american patrons of the pinakotheks. and the moderne was more than redeemed by a pair of installations placed side by side through the genius of the curatorial staff. from the stairs to the second floor, a green glow can be seen emanating from one of the galleries. this turns out to be an enormous, high-ceilinged room filled with a dan flavin fluorescent tube sculpture. 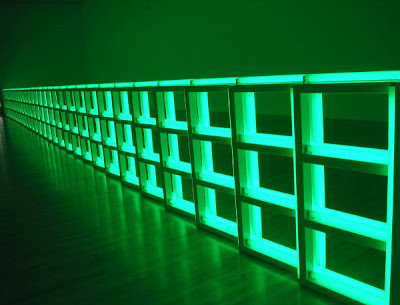 the green light is remarkably penetrating, such that the tubes begin to vibrate slightly after just a few seconds of observation as parts of your retina become violently overstimulated. the galleries visible through the two exits turn pink, as does the light from the skylights, the way everything turns blue at sunset during the blue hour. exiting the flavin room in a pink haze, green tubes seared into our retinas, we then came on fred sandback's pink flamingo, two thin columns of pink yarn descending from the ceiling in a white room that, to green-accustomed eyes, vibrated in shades of pink. at the same moment, a man in a pink shirt and a woman in pink pants came into the room. their shadows blocked out the green light from the entryway for an instant, in which time the sculpture flashed the deep, saturated colour of lawn flamingos. a magic moment.